1. 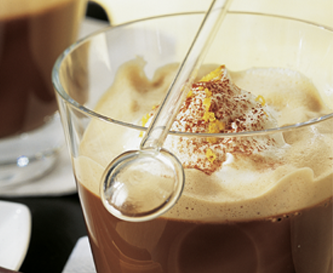 Stir the cocoa and the syrup into the coffee, sweeten to taste and pour into tall glasses. 2. Froth up the milk and pour over the coffee. If you wish then add the chopped nuts as a garnish before serving. 1. 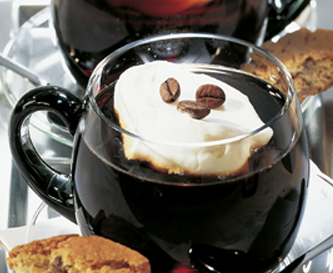 Warm the glasses and add a teaspoon of sugar and two coffee beans to each. 3.Whip the cream until stiff and add to the glasses. Finally garnish the Café Sambuca with the coffee beans. 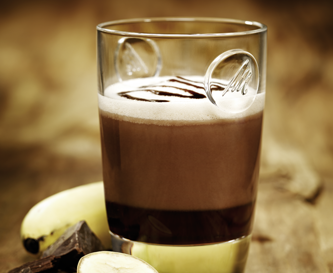 Pour espresso into a glass then add the banana juice, finally add the chocolate. Decorate with frothed milk and chocolate sauce. 1. Warm up the milk and the cinnamon stick (don't boil), Remove the cinnamon stick and froth up the milk. 2. Put a piece of chocolate into each of 4 glasses. Half fill with coffee and stir carefully. 3.Add the milk and the frothed milk and dust with cinnamon. Sugar to taste. 1. Whip the cream with the vanilla sugar until stiff. 2. Make the fresh coffee and pour it into the cups. 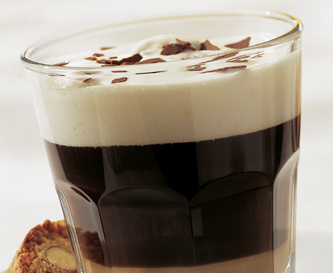 Pour in the cream liqueur slowly over a spoon, creating two colour layers. 3. 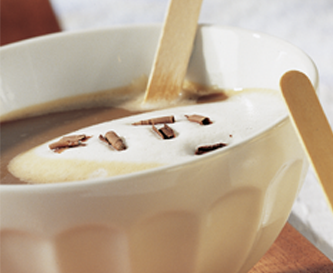 Add a topping of cream to the mixture and garnish your cream coffee with grated chocolate. 1. 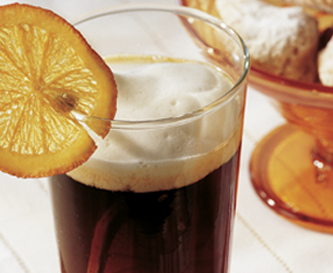 Mix the rum and the orange liqueur, pour into the glasses and fill up with the freshly brewed coffee. 2. Whip the cream until it is stiff. 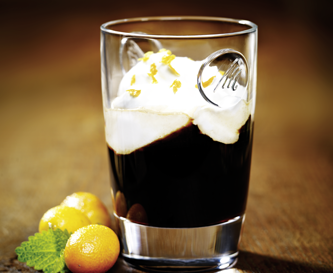 Add a topping of whipped cream to the coffee and garnish with a slice of orange. 1. Whip the egg yolks with 1 ½ tablespoons of sugar until frothy. Put the bowl with the egg yolks in a pot of hot water and heat up the mixture. Stirring continuously, add the coffee, liqueur, nutmeg and lemon peel. 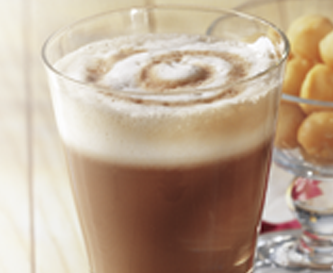 Whip the mixture until it is frothy and creamy and pour into heated glasses. 2. Whip the cream with the remaining sugar until it is stiff and add a topping of cream to each glass. 3. Sprinkle with cocoa and serve with sponge fingers. 1. 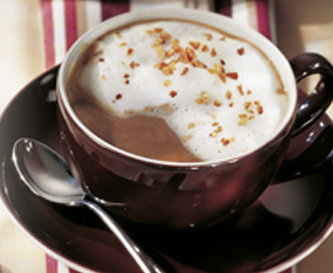 Stir the cocoa and the hazelnut spread into the coffee and pour into four cups. 2. Add 2 tablespoons of dark chocolate and allow to melt. 3. Heat the milk, froth it up and pour over the coffee. Garnish with the remaining dark chocolate and serve immediately. 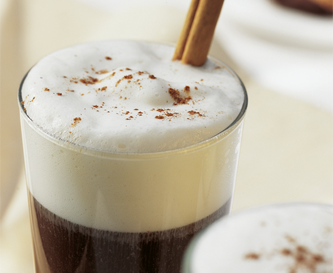 Pour the white rum and Curaçao Triple Sec into a glass and fill with hot coffee. Decorate with a topping of cream and grate some organic orange peel over the top. 1. Wash the orange in hot water and peel with a peeling knife. Cut the chilli into 3 lengthwise. 2. Put the coffee in a pot with the orange peel, the cinnamon sticks, the chilli, the cloves and the sugar, stir and bring the mixture to a boil. Allow the mixture to simmer for 15 minutes on a medium heat reducing the amount by half. 3. 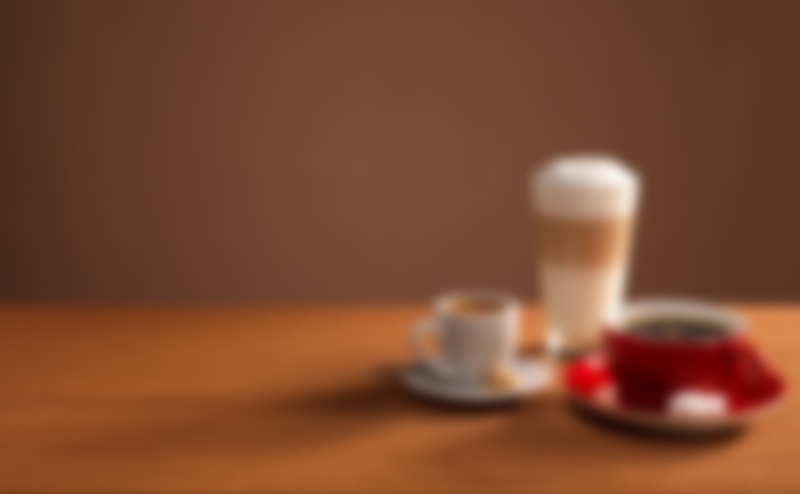 Pour the milk evenly into 4 latte-macchiato glasses and froth up with the Perfect Cappuccino. Then carefully pour the remaining coffee through a sieve onto the frothed milk. Tip: Decorate this delicious drink with a thin slice of orange peel! 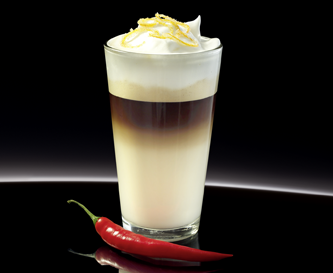 After preparing the drink with lightly frothed milk add a shot of tequila. Flambé and enjoy the drink when the flame burns out. Time to enjoy! - bon appetit! 2. 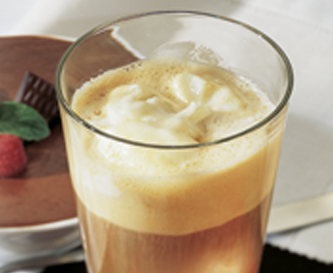 Pour the hot coffee over the ice cream and add a topping of chocolate mousse. The melting ice cream gives your coffee an interesting marbled effect. 1. Put the mocha beans into 4 glasses, pour in the coffee and stir until the mocha beans have melted. 2. Heat the milk, froth it up and pour into the glasses. Sweeten to taste and sprinkle with hazelnut praline.